Go and check out our special page. On April 23, 2014, we were featured in the Marietta Daily Journal. The article talked about how our outdoor classroom used to be like, and how we renovated it to make it usable. click the link to the left to see the article online. While most people are in the Panhandle, a large group of dedicated volunteers from ages 9 to 59 are working on the newly renovated outdoor classroom. The stairs and grand entrance are almost completed, and volunteers are currently working on staining the benches, the stage, and the tables down below. Mrs. Dimare and her husband brought us some beautiful native ferns to plant by the stage. This renovation of Wolfie’s Woods has been accomplished completely by the hard work of volunteers! Their dedication and hard work will benefit Timber Ridge students for years to come. Keep checking this blog for exciting news, appearing soon, about a Wolfie’s Woods blogger who is contacting the original Eagle Scout who built Wolfie’s Woods in 1993, twenty one years ago! This is sure to be an exciting article. *This video will not display if you are using Cobb County School District wifi due to web filtering. Timber Ridge students…get ready! We are busy working on new outdoor classrooms for learning. 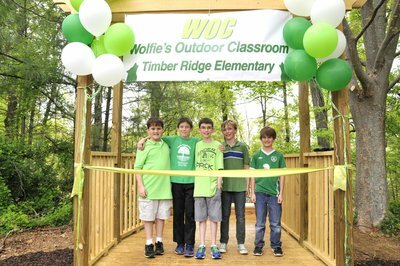 Wolfie’s Woods is currently under renovation and we also have plans for another outdoor classroom renovation to begin soon! Enjoy this blog of project updates and students thoughts about what it will be like when we are learning in the great outdoors.